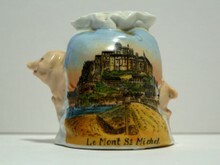 From France I obtained a small souvenir piggy bank (head to tail 9 cm). For an antique one in mint condition. Expensive due to the ridiculous high postal costs in France, but I wanted to have it, so I should not complain. What’s the age of such a piece? For souvenir piggy banks the picture on it is helpful, because they are (in 90% of the cases) a copy of a postcard from that period. The postcards (courtesy of Delcampe.net) I found on the internet are from 1904 and 1905, so I concluded that the piggy bank is from the same period. 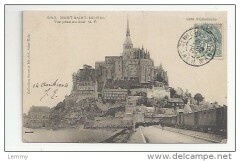 The picture on the postcard in this particular case was enlarged and coloured and used for a transfer on the piggy bank. 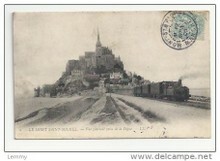 On the right you see the carriages of the train to Le Mont Saint Michel.